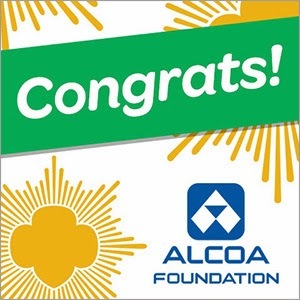 Congratulations to Gabriella Smith, Gold Award Recipient from Girl Scouts of Eastern Massachusetts and Kaitlyn Kanis, Gold Award Recipient from Girl Scouts of Northern Indiana-Michiana, for winning the inaugural Alcoa Chuck McLane Scholarship! In June, Girl Scouts of the USA partnered with the Alcoa Foundation to present the inauguralAlcoa Chuck McLane Scholarship available to Gold Award recipients who completed projects in STEM. The scholarship honors Chuck McLane, a retired Alcoa Executive Vice President and Chief Financial Officer. McLane, a GSUSA Board member, championed this program in support of young women pursuing a STEM education. Concluding a 40-year career with Alcoa and Reynolds Metals Company, Alcoa and Alcoa Foundation share McLane's commitment to inspire girls, women, and other under-represented groups on the journey to STEM-related careers. Through 2017, Alcoa Foundation will provide $10,000 scholarships to two girls a year. In addition to financial support, an Alcoa employee will mentor the scholarship recipient during her freshman year of college. Gabriella Smith earned her Gold Award with her project on Haggett's Pond in Andover, Mass. Her project focused on mapping Haggett's Pond's many trails, constructing a kiosk to house the park and pond map and providing a website so visitors can access the map on their smartphones and share photos. Kaitlyn Kanis earned her Gold Award with her project focused on Churubusco Community Park in Churubusco, Ind. Her project focused on building 12 bat houses in the park to create an environmentally friendly solution to the millions of mosquitoes in Churubusco Park. Stay tuned for instructions on how to apply for the 2014 Alcoa Chuck McLane Scholarship!